Hello! 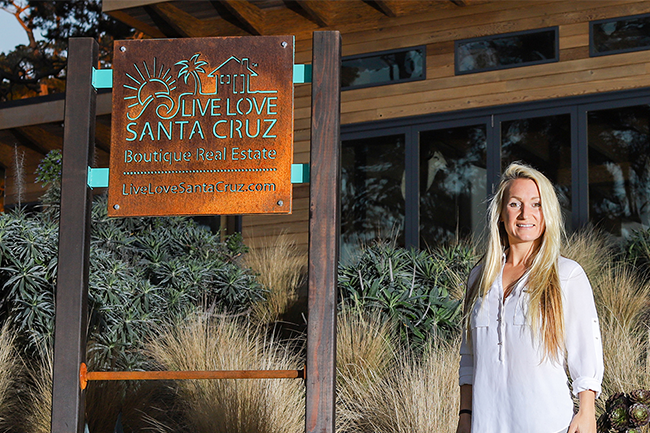 It’s Bri Chmel, owner of Live Love Santa Cruz, Boutique Real Estate. 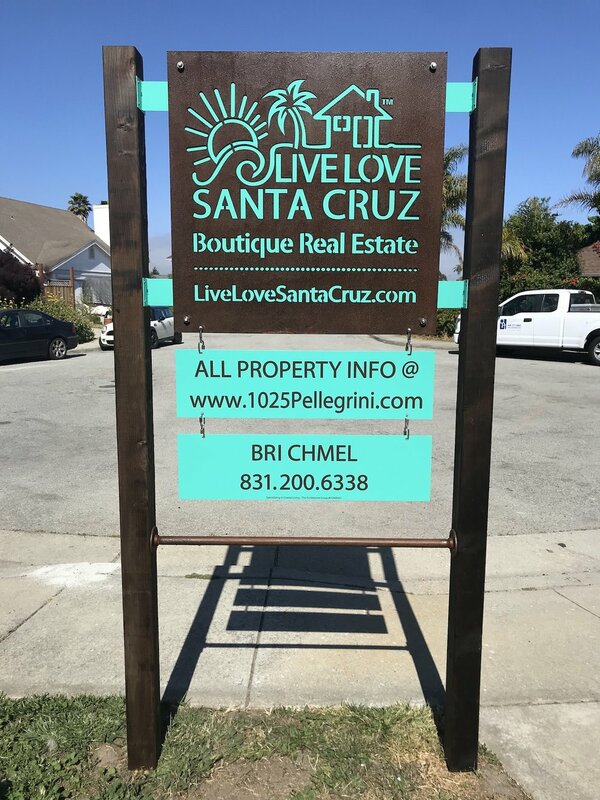 One of my dreams ever since I started Live Love Santa Cruz was to to replace the typical plastic real estate sign with a beautiful custom sign for our clients that exemplifies our commitment to creative marketing and great service. Our clients deserve something really great in front of their home when it is listed for sale. A few months after I started the company, I put this dream down on paper and started the process. It took about one year from design to implementation to have seven of them in the field. It also took tons of work and maybe a little too much money…. These signs are meant to reflect the same amount of love and care that people put into their homes. So many people have commented and asked questions about them that it seems like they deserve a blog entry about the entire story! In the meantime, please give us a call if you are interested in buying or selling a home in coastal California! 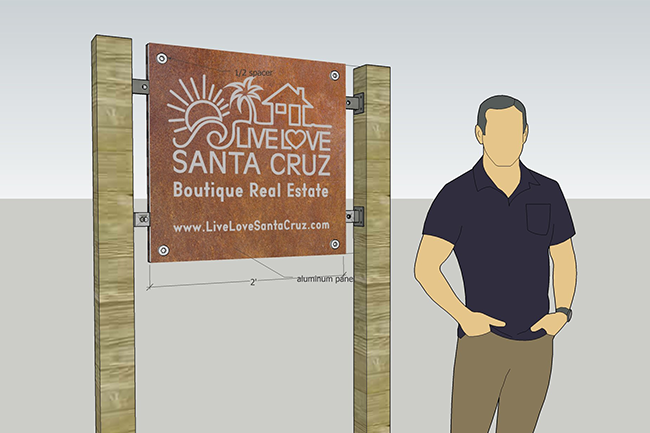 At Live Love Santa Cruz we bring a fresh and innovative approach to real estate in the Santa Cruz area. We are a “boutique” real estate company. We fulfill all aspects of the real estate experience completely in-house. Our complimentary services include 3D virtual home tours, aerial drone cinematography, architectural photography, custom property web pages, and social media advertising. For those seeking a little something extra we also offer home design and professional staging. In addition to providing custom virtual home tours to out-of-town buyers, we always go the extra mile to help our clients find special on and off-market properties. And yes, we do sell outside of Santa Cruz! Please check out our sister company’s website, www.BixbyRealty.com. Who’s idea was it to build custom listing signs? It was my idea! I believe that our listings deserve a beautiful work of art in the front yard. Homes on the California coast are not cheap, so they need something better than a plastic sign blowing in the wind. 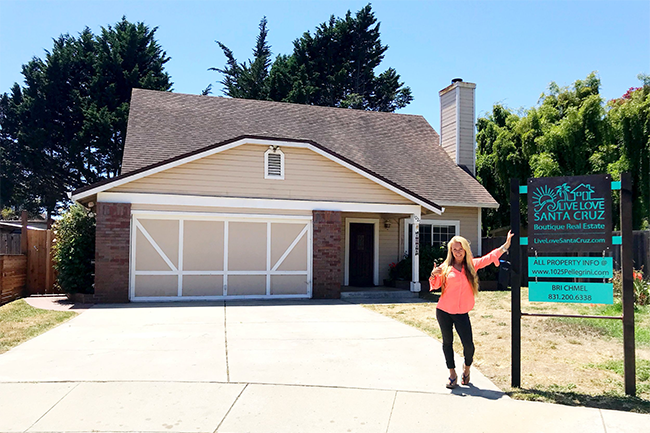 When a buyer drives up to a home, the sign is the first thing they see. If it is a high quality sign made out of real materials, it will make a lasting impression on them, as will the listing. 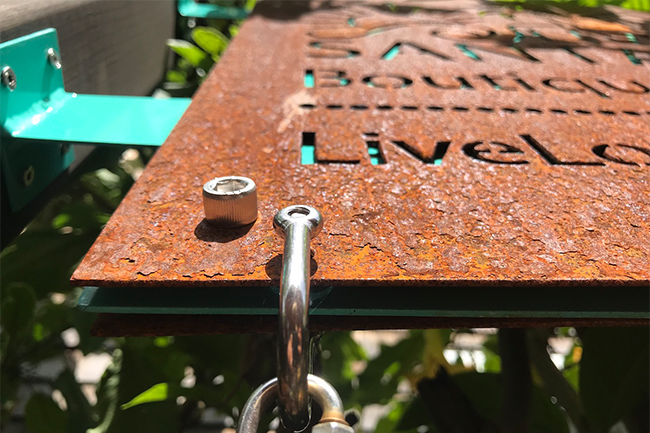 They are made out of rusted and sealed Corten steel, powder coated aluminum, stainless steel fasteners, and stained wood posts. 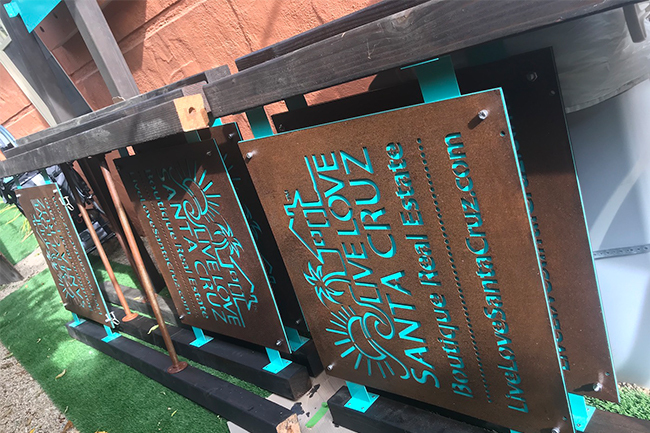 I really wanted to go with a set of modern materials, and Corten steel is a really cool element that is currently being used on a lot of architectural buildings and signage. What is Corten steel, and why use it? Corten steel is also known as “weathering” steel. It is a type of steel alloy that was developed to eliminate the need for painting. It forms a stable golden brown rust appearance. The surface oxidation of the steel typically takes a couple of months, but I used a special acidic mixture to rust them myself in just a few weeks. After they were rusted I took a wire brush to them to get all the excess large bits of rust off, and layered them with a very special sealer made for Corten steel. 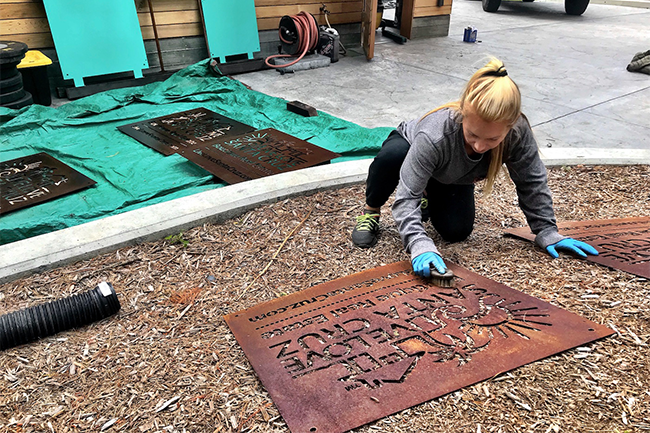 The thing with Corten steel is that if you do not seal it, it will continue to rust and it will actually drip rusty water (which stains) on everything that is below it. I chose to use Corten steel as the main element in my signs because I really enjoy materials that take on character. Materials that can tell a story! I also really like aged barnwood. I love mixing natural elements with solid, smooth colors in both my homes and signage. Who designed the Live Love Santa Cruz logo? That would be me as well (with a little input from my significant other). Above is actually the picture of the first logo sketch up from a day when I was doodling and coming up with ideas. I wanted to create something that was both professional and fun, something that stood out. It was my goal to have a logo that really reminded people of the oceanfront in Santa Cruz. I wanted a logo that would also be a catchy sticker on the back of a car, as everybody in Santa Cruz loves their Santa Cruz stickers! My significant other is the one that really helped with this part. He is really good on Google’s design program called sketch up. We put our minds together for a few hours and came up with the first render of the sign, pictured above and below. Dimensions of various parts definitely changed a few times throughout the process. It was actually a couple month design process with the file going back and forth to the metal shop. As with any construction project, little things always come up that you don’t think of in the design process, which need to be changed when it comes to what the sign is going to end up being like in real life. I learned a lot about designing a sign, as there were quite a few different pieces that needed to work with each other. Did you do the metal work too? I had a specialty metal worker cut the logos from the steel and make the inside of the sign as well. The machines that do this are quite expensive and the technology is pretty neat as they are very accurate with their cuts within the logo. The metal on the signs were delivered to me unassembled. Before I put them together with all the stainless steel fasteners (which were all complicated to order as the sizes and lengths were so crucial) I had to rust the outside Corten steel pieces. This took a few weeks, spraying them every day with the acidic mixture that I made. As mentioned before, I then cleaned them with a very stiff brush to get any excess rust off, and coated them with a very special sealer that is made just for Corten steel. This stuff was extremely stinky and yucky! I also bought a bunch of 4x4 posts, cut them to exact lengths, and stained them a really dark brown. Next came the assembly process, which actually took a lot more time than expected. I had a little help doing this from a few guys and my significant other, because the pieces were hard to get lined up on my own. 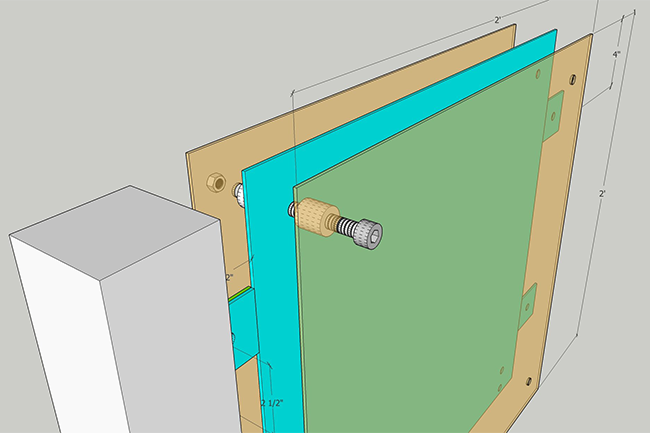 I didn’t want to make any mistakes when drilling holes. Next was figuring out how to make the signs stand up! The signs slide over long concrete stakes that you pound into the ground. Drilling these 12” holes in the bottom of each of the posts was quite a chore. Above is a picture of us assembling one of the signs. This was some tedious work, making sure all the parts were lined up perfectly. I love the stainless steel fasteners against the rusted Corten steel. The contrast is really nice: dull vs shiny. Thank you for reading our blog! We have a lot more exciting news coming up, so be sure to stay tuned! 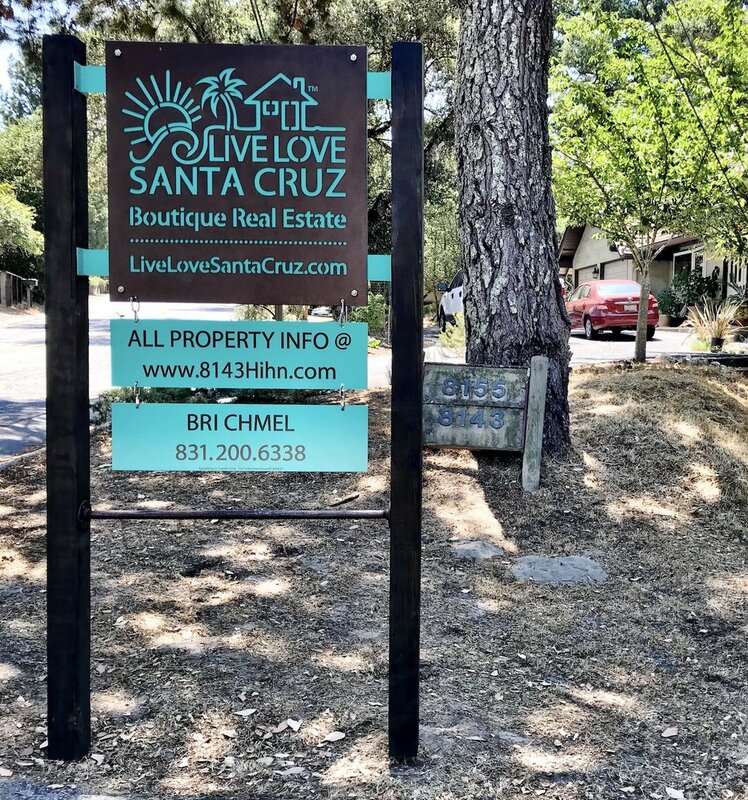 Live Love Santa Cruz and Bri Chmel represent record sale in Santa Cruz!